PVDF’s (Polyvinylidenefluoride) balance between thermo, chemical and physical properties allows for its use as a high performing plastic for a variety of applications. 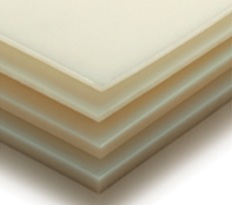 Exhibiting a broad operation temperature (-30°C to +150°C), excellent chemical resistance and high strength, PVDF is highly resistant to most environments. PEI (Polyetherimide) has a high mechanical strength in connection with a good chemical and heat resistance. Its unique torque strength permits the economical substitution of machined fabricated small parts from steel. PSU (Polysulphone) is characterised by its high strength, self extinguishing ability, good electrical characteristics and resistance to chemicals. PSU is suitable for medical for food applications where sterilization is frequent. PPS (Polyphenylensulfide) closes the gap between the technical synthetics and PEEK with its strength and economy. With glass fibre reinforcement far greater strength is achieved, which is comparable with light metals. PPSU (Polyphenylensulfone) is an amorphous material, with improved impact and hydrolysis resistance compared to PSU. It has extremely high notched impact strength, even after a heat aging.